Brand new four track ‘double B-side’ EP, featuring two tracks from BEAK> and two from their ‘alter-ego’ < KAEB, who differ in the aspect that < KAEB can have an ever expanding and floating membership. 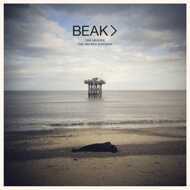 BEAK> are Billy Fuller, Geoff Barrow & Matt Williams. The trio hail from Bristol, UK.